After splitting audiences’ sides apart with their previous pairing in The Other Guys, Will Ferrell and Mark Wahlberg reunite for a much tamer and more family-oriented film that should be the comedy treat of the Christmas season based on that pairing alone – but sadly, even they are let down by a script that ultimately relies far too much on formula and hackneyed convenience to be considered even remotely funny. Ferrell is Brad, a mild-mannered step-father to two personality-free young children who has his neat life challenged by the arrival of the kids’ biological father Dusty (Wahlberg), who himself is eager to reassert himself as the sole father figure. From there, it’s mostly the kind of hijinks you’d expect from this type of movie, whether it be physical humour at Ferrell’s expense – he is thrown into a wall from a motorcycle in one instance, and electrocuted while skateboarding in another – or ham-fisted morals intended on giving it some kind of heart. That’s all well and good, but at the end of the day, it’s just not that funny. Director Sean Anders, previously responsible for Horrible Bosses 2 and – shudder – That’s My Boy, is working from a surprisingly safe script which he co-wrote with Brian Burns and John Morris, one that perhaps doesn’t take as many risks as it probably should. As a result, everything feels very by-the-book and filled with characters, scenarios and even jokes that we’ve seen many times before, and honestly done much better – nothing about it feels fresh or even that interesting, and it’s just overwhelmingly stale. Is it the worst comedy of the year? Absolutely not, and we would much rather sit through this than at least five much worse comedies we’ve seen this year; but considering the talent involved, it really is a shame that even they can’t lift the material further up from what it is. Ferrell and Wahlberg do make an effective double act – The Other Guys is proof of that alone – and to their credit they are at the very least trying to recapture that magic here, but the script simply isn’t strong enough to support their pairing (though Wahlberg probably gets the bulk of the more amusing moments with his impeccable comedic timing, including – of all things – reacting to Frozen with such invested curiosity). The majority of the film may not be particularly chuckle-some, but trust us: it’s absolutely worth it for the ending. For obvious reasons, we won’t give anything away, but the reason it works isn’t necessarily due to the writing or even the acting, but rather the casting; who they got to play this minor role within this particular context is absolutely laugh-out-loud hilarious, which may sound weird once you actually see it, but for us it was by far the funniest part of the entire film (for now, we’ll say that he’s appeared in at least two other comedies this year, stealing the show from other established comedic actors). 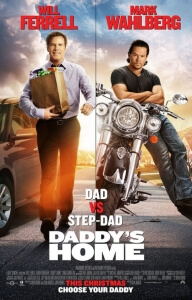 Aside from that slice of gold, though, there’s not much you’ll find with Daddy’s Home that warrants much laughter. Just plop in The Other Guys into your DVD player and find much more earned laughs there.